Vudafieri-Saverino Partners design the Vip Lounge of the 25th edition of Artissima Fair in Turin and the temporary exhibition SOUND at OGR. With the intention of amplifying the perception of the balcony as a suspended space, warm and far from the frantic rhythms of the pavilion, Tiziano Vudafieri and Claudio Saverino choose to install a metaphorical sky under which to welcome guests. The temporary floor of Cantiere1 / Terrazzo, created by Roberto Coda Zabetta in Naples for the complex of the SS. Trinità delle Monache with the Matronon of the Donnaregina Foundation for the contemporary arts / MADRE, becomes the protagonist of an unprecedented concept turning into a large ceiling painting. The gigantic painted canvas occupies and modifies the space in an original way, transforming the perception of the balcony with a play of light and color. The vector and concentric movements created by the colored pigments, applied and removed by the artist thanks to an air compressor, create a transparent space that seems to give off a cosmic energy. The space furnishings project has been produced in collaboration with Cargo. The new curated section of the fair dedicated to contemporary sound investigations. 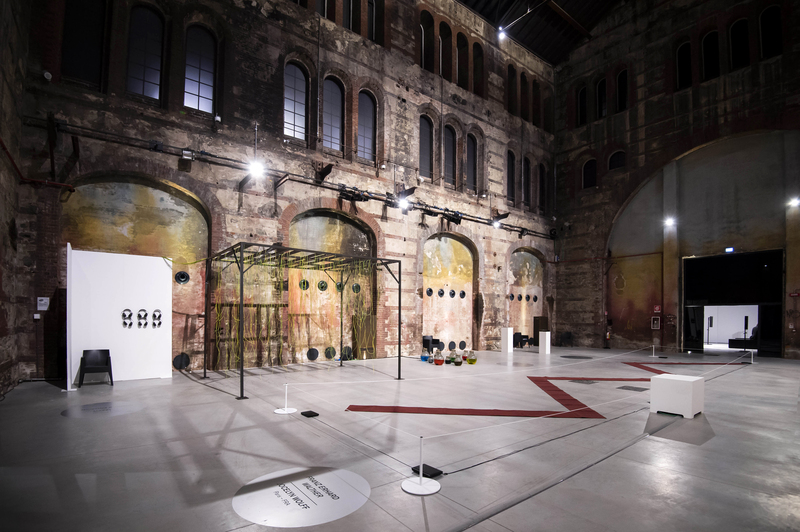 The exhibition is located at the OGR - Officine Grandi Riparazioni di Torino. In confirmation of the experimental nature of Artissima, and in synergy with the cross-cutting research dedicated to the music, performance and art of OGR, Sound presents 16 monographic projects dedicated to the sound selected by Yann Chateigné Tytelman, curator and art critic in Berlin and professor associate of history and theory of art, HEAD, Ginevra and Nicola Ricciardi, artistic director, OGR - Officine Grandi Riparazioni, Turin. The section is born in response to the recent attention given to the sound from part of artists of different generations, to question the logic visual art. The sound, in its intimate and performative aspects, is used for transforming space and its perception, to reactivate memories, to free imagination, and is today the protagonist of numerous research in areas heterogeneous because of its ability to evoke and unveil a reality intangible, always changing.